Kids are pretty much like a box of chocolates – you don’t really know what you’ll get until they start to grow up. Of course, you can’t discount genetic dispositions, but what about other talents and gifts such as music? 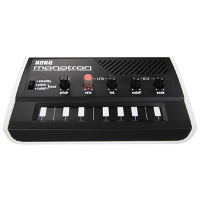 Don’t wait until it is too late for your little one to grow up and find out – do so earlier with the Korg Monotron. This £59.99 purchase could very well be associated to a stylophone on steroids! Being battery-powered, it allows you to create weird and wonderful music unlike those that you have heard of before, boasting a titchy keyboard and intuitive knobs that could be tweaked accordingly. Other features include voltage and low frequency-controlled oscillators that ought to help you compose the next big sound in the club scene.